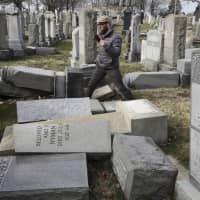 NEW YORK - Since the end of World War II, American Jews have lived in relative peace and prosperity, convinced that anti-Semitic attacks were a horror left long behind them. But the massacre of 11 people at a Pittsburgh synagogue on Saturday was a brutal reminder that those days are back, resurrected by the advance of extremism and polarization in the Trump era, and fueled by the hatred voiced on social networks. American Jews — some 5.3 million people, including nonpracticing Jews, according to the Pew Research Center — had an “illusory sense of invulnerability,” said Jacques Berlinerblau, a professor of Jewish civilization at Georgetown University in Washington. “European Jews never had that sense. Now, that sense of invulnerability has been shattered,” he said, echoing sentiments expressed widely by Jewish Americans on social media since a gunman stormed the Tree of Life synagogue. Kenneth Jacobson, deputy head of the Anti-Defamation League, which combats anti-Semitism and discrimination, said it has been a progressive awakening for American Jews about the dangers they face. Over the past two decades, “what we were often hearing from American Jews was, ‘Why is ADL still in business? Anti-Semitism in the U.S. is no longer a problem,’ ” Jacobson said. But with the rise in the number of attacks on Jewish targets in France and across Europe in recent years, “there was more of a conversation in the Jewish community, anti-Semitism was more on people’s minds,” he added. Many were jolted last year when neo-Nazis paraded through the city of Charlottesville, Virginia, chanting “Jews will not replace us,” while there has been a marked rise in recent years in the number of swastikas being painted on walls and bomb threats against Jewish institutions. “There is a recognition that anti-Semitism is here as well,” Jacobson said. 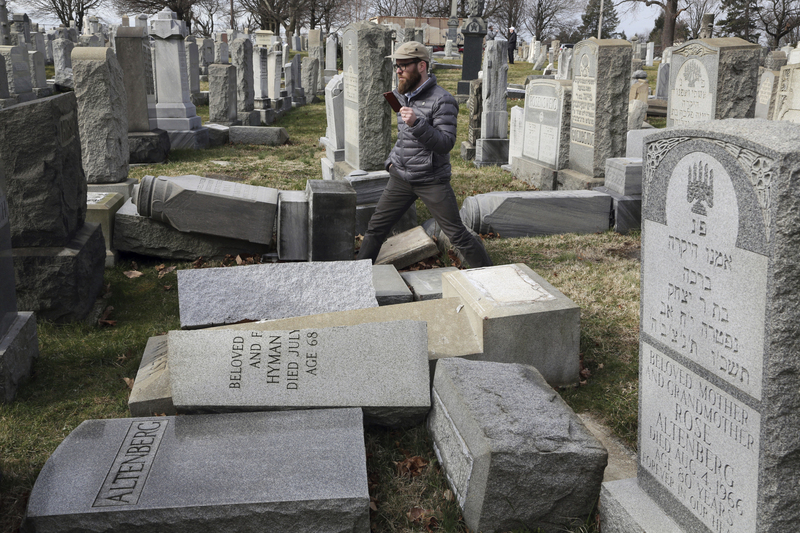 In February, the ADL reported a 57 percent leap in the number of anti-Semitic incidents in 2017, the sharpest yearly spike since the 1970s. With midterm elections looming, anti-Semitic attacks, in particular against Jewish journalists, have multiplied recently in online forums, according to a new ADL study that listed a number of hashtags and code words used by white supremacists. Among the most widespread were #NWO, standing for the “New World Order” which Jewish elites are accused by racists of preparing, and “globalist,” an expression often associated with the Jewish billionaire philanthropist George Soros, a favorite target of far-right extremists. He was one of a slew of Trump critics targeted by mail bombs last week. “There is a new technology of terror and this technology has not been good for the Jews,” said Berlinerblau. “Everyone recognizes there is much more of this coming, with the guns in this country,” Berlinerblau said. Many American Jews have now accepted that extremism is on the rise — a sentiment expressed by parents dropping off their kids at the large Jewish community center in New York’s Upper West Side on Monday. “It just contributes to the overall climate” of violence and divisiveness during the Trump era, she added, even though the president’s son-in-law is Jewish and his daughter Ivanka converted to the faith. Before Pittsburgh, there had been swastikas and graffiti, said the university professor, but nothing on this scale. “My biggest fear is how many more attacks like these there will be?” he said. Like many of the great Jewish institutions of New York, the community center is protected by measures that aren’t exactly new: an armed guard at the front, and airport-style screening for visitors with bag checks and metal detectors. Even as the mayor of New York announced heightened protections for Jewish institutions, Jacobson of the ADL said American Jews must not succumb to living in a state of fear like their European counterparts. “The beauty of American Jewish life is that there was a sense that we are completely equal citizens, and we want to find that right balance between protecting ourselves, our children, our institutions, but also find that natural comfort level we have as Americans and as American Jews,” he said.